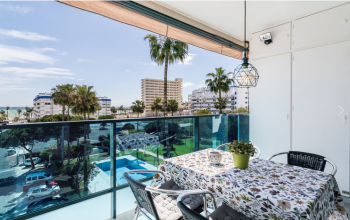 Very sunny and bright property, oriented to the south-west, with large terraces, salt water pool, garden and bbq area to enjoy the fantastic weather of Costa del Sol. 3 floors villa, with independent access to the house from the main floor and also from the ground floor. Solar panels. Alarm system and video cameras. Garage with space for 2 cars. Very spacious villa with sea view and facing south with independent apartment. Close to the city of Vélez-Málaga and only 8km far from the beach, this villa has a spacious living room, a dining room, a fully equipped kitchen. 4 bedrooms, 2 bathrooms, 3 covered terraces with garden furniture and open onto a very well maintained tropical garden. Spectacular middle floor apartment in the well sought after Edificio Torrealmadena in Benalmadena Costa. The location of this apartment is perfect: walking distance (all flat) to everything. The beach is only 150 meters away. The apartment has a spacious living room with modern open kitchen, 2 bedrooms with built-in wardrobes and 1 bathroom. 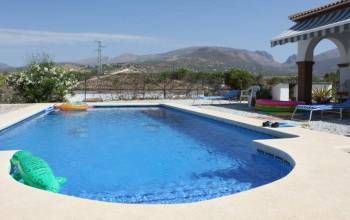 Luxury villa located nearby the village of Sayalonga, in the province of Málaga, in Andalusia. Only 20-minutes drive from the Mediterranean and 1 km from the village of Sayalonga where we recommend you to taste the typical tapas accompanied by a good wine. This large villa of character with two floors and 4 bedrooms can accommodate 8 people . This spectacular contemporary 2 level villa is completely renovated in 2017. The best materials were used and that really shows: high quality finish. Top quality windows throughout the building. The floors of the interior and the pool area are cream marble. On the top floor (entry level) you will find an open plan living room with cosy fireplace. Detached 4 bed villa. Entrance by video & electric gate. lg drive. 4 beds 3 bath, lg heated pool,double glazed, marble floors. Are you looking for a luxurious property in Andalusia, Spain, for a vacation or a long-term rent? We have got you covered! First Oasis is a highly reputable real estate agency based in Málaga. We offer a convenient digital solution for online advertising to property owners and provide our private customers with an up to date catalog of the hottest Andalusia properties for rent and purchase. Make your real estate available to tenants from all over the world! How to use our platform? Property owners need to register and subscribe to post their ads online. First Oasis offers advertisement services to private individuals as well as companies. You can also use our free advertisement option if you are sure one post is all it takes to find a tenant for your beautiful Andalucia property. 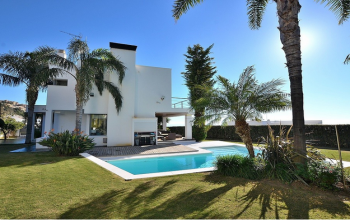 Those looking to buy or rent should check out our wide selection of charming villas, cottages, townhouses, apartments and offices in Malaga, Almeria, Sevilla, Grenada, Cadiz, and other regions. No need to browse through all Andalusia properties! Just use our convenient filter above the catalog where you can specify location, property and listing type, price, number of bedrooms and bathrooms, and other accommodation features. The system will then automatically narrow down your search to the results that match your criteria. Each listing goes with an extensive description and high-quality images to give you the full idea of how the place really looks like inside and out. First Oasis property specialists constantly monitor the market to make sure you get the most coveted listings at competitive prices. Our managers know everything there is to know about real estate in Andalusia, Spain. If you need any help advertising your property or finding accommodation, don’t hesitate to contact us anytime.